It is election day! Fingers crossed…. ;-) Before today I was searching for various organizations’ endorsements of California ballot measures. Finally located some data, and was curious how it would appear as a network showing the organizations and the propositions they support. 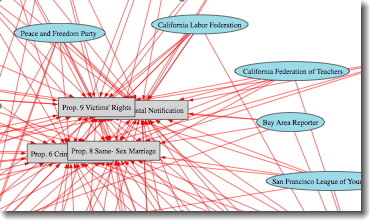 Was able to scrape data for University of Berkley’s IGS Library Ballot Measure Endorsement page (for Nov. 2008) and create a few network images.